LIFEMATE Anniversary promo is here again. As a way to say a BIG THANK YOU to all our customers for your patronage over the years. 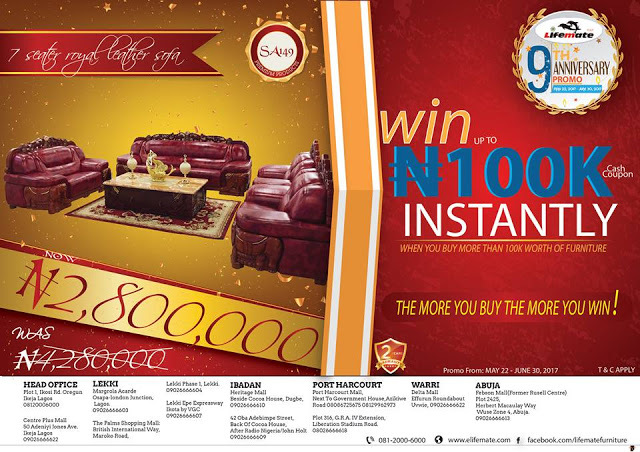 We are giving out CASH COUPON instantly when you buy more than N100K worth of Furniture. The more you buy, the more you win. Grab this opportunity and furnish your home with our stunning collections of furniture. Home Furniture, Office Furniture, Kitchen cabinet, sanitary wares and outdoor furniture. Visit any of our showrooms nationwide and our Newly opened furniture outlet @ Centre Plus Mall 50 Adeniyi Jones Avenue Lagos.shop for items at incredibly discounted rates.